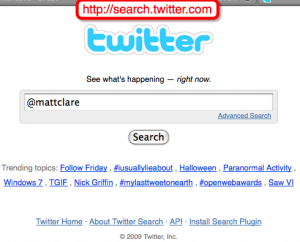 Allow me to promote my latest web/twitter project: timelesstweet.com or @timelesstweet . If you’ve used twitter, or even if you haven’t, you may be familiar with the “Did you hear? A celebrity died. RIP celebrity.” theme or “Can’t wait for the weekend!” them found in a lot of people are saying there. This is what inspired me to create timelesstweet.com – a collection of generic thoughts like this that always seem applicable. If you’re on twitter follow @timelesstweet, and if you’re not, visiting timelesstweet.com might give you some more reasons not to. Here’s how you can add your “at messages” to your Mac Mail.app 10.5 or 10.6 (or Thunderbird or Outlook Pro, etc.) via Twitter search’s RSS feed. Grad the RSS feed URL found on the right of the results page. In Mail.app’s bottom right (or in Thunderbirds’ or Outlook’s account preferences) add a new RSS feed. Paste in the RSS URL. You may want to also check to have it appear in your RSS feed. and press “Add”. That should be it! Now whenever your account gets re-tweeted, “replied to” or otherwise mentioned you should see it in your inbox. Sure our inboxs are all already too full, but at least these messages will be short. 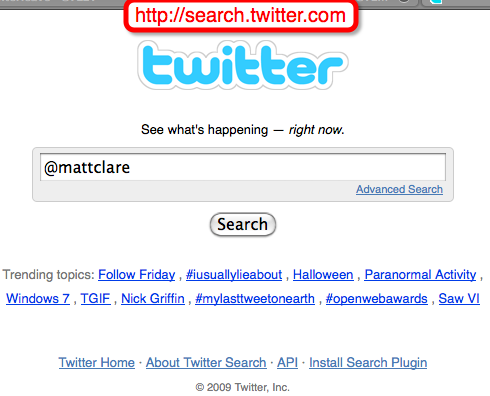 You are currently browsing the iMatt :: The Blog of Matt Clare weblog archives for October, 2009 .